We are Lumad, Moro, and Christian women who gathered together in Mindanao for a workshop on “Leadership Development and Capacity Building for Gender and Ecological Justice” held on May 21-27, 2017. We affirm that ecological justice is an imperative of our faith–with its bias for the poor and the oppressed—and also central to our national consciousness and major agenda of women’s emancipation. We believe that we can only know the reality and truth about the deleterious effects on women of environmental destruction, poverty and lack of social services by immersing ourselves in their communities. It is by integrating with them in their ancestral lands and listening to their stories of pain as well as resistance that realities will be unfolded to us. Hence, we visited Moro and Lumad communities in Brgy. Kidayan, a Moro community, and Sitio Kidupong, Brgy Dumulol where Dulangan-Manobos live in Palimbang. Sultan Kudarat. Here we were humbled by the warm welcome and hospitality of the communities. During our two-day visit, we breathed in with them the wind of poverty–lack of water, proper sanitation, basic health services and educational facilities. Farmers, both women and men, have been working hard for daily survival, but remain saddled with heavy debts. Worse, their ancestral domain is threatened by ecological degradation and intensifying capitalist plunder and land grabbing. 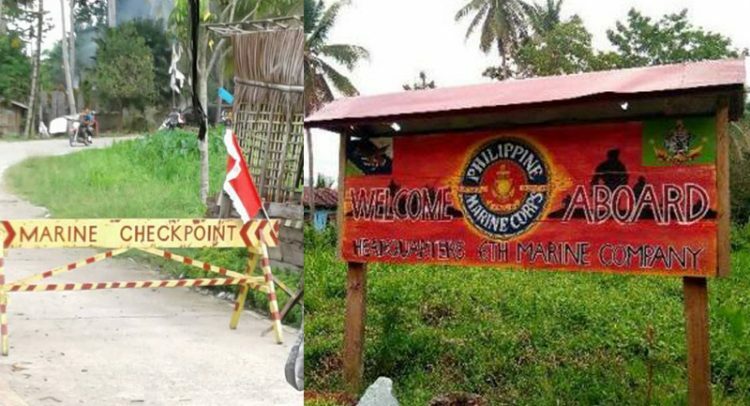 However, on our way back to the city, two days after Martial Law was declared in Mindanao, we were accosted by soldiers of the 6th Marine Company Marine Battalion Landing Team 6 Check Point. Our truck was stopped and we were held for more than one hour and thirty minutes. Our representatives were interrogated, asked to produce identification cardscheckpoint and questioned about our permit to travel. An officer, who did not want to give his name, blurted out, “Who are you? Don’t you know that the communities you visited are dangerous areas which we would not even dare go to go!” . They also asked why our group did not ask permission from them when they could have accompanied us and given protection. Another officer asked if Suara Bangsamoro woman leader Ipang and a Kidapawan woman were with us. Our representatives were forbidden to take down notes during the questioning. While our representatives were being questioned, a marine man took pictures of our group who were left waiting in the truck. We were instructed to write down our names on the backside of the stationery of the Philippine Coconut Authority. Particularly irksome were the, sexist remarks about whether there are single (virgin) women among us since there are many unmarried soldiers in the camp. We consider these sexual innuendos as a form of harassment. We were reminded of many incidents of sexual harassment inflicted on women under military custody. This incident took place two days after Martial Law in Mindanao was declared. We believe that our civil and political rights must be upheld. The militaristic approach can only result in human rights violations and the rule of might rather than right. We call on women of different persuasion to strengthen and deepen our resolve to resist in the pursuit of ecological justice, people’s welfare and rights. We call on all women to work in solidarity with Lumad and Moro women who are rising up to defend their ancestral domain, and to put an end to centuries of patriarchy and sexism in all aspects.